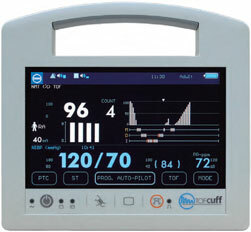 TOF Cuff is a NMT (Train of Four) monitor that incorporates a simple to use Auto-pilot system that enables the anaesthesiologist to initiate by simply pressing a button. From induction to reversion, TOF Cuff will adapt the TOF, ST or PCT stimulation patterns and pacing intervals completely autonomously without medical intervention. TOF Cuff uses a modified NIPB Cuff with integrated electrodes to measure peak muscle contraction during TOF, ST or PCT stimulation patterns. The peak muscle contractions are then compared with a base line stimulation response taken from the patient during the initial calibration mode on the Auto-Pilot function to provide the anaesthesiologist with the patients Tof % and Tof count. The Modified NIBP Cuff can also be used for NIBP measurement which also takes place autonomously when the Auto-Pilot function is engaged. TOF: 12 s, 30 s, 1, 2, 5, 10, 15, 30, 60 min.